Just wanted to show you guys my nails today! They look so cute! I did my own gels last week so the blue base is a little bit old looking now but I'm still proud of myself, they've lasted over a week already and I'm not even trained haha. 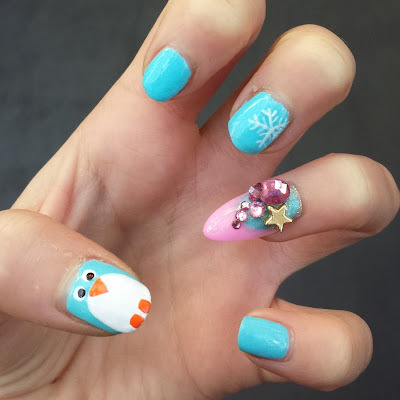 One of the girls at work did the penguin for me after I spotted someone posting it on facebook this morning and I just liked the idea of the snowflake whilst I had my nails blue. We sell these nail glitz at the nail bar where I work and we are promoting them for Christmas so I took one from the barbie set for my crazy pink nail!